We have been a Shotgun Cabinet manufacturer for over twenty-five years from our factory here in Nottinghamshire. All our Shotgun cabinets are made to British standard 2881:1994 which is the requirement for the storage of Shotguns in England, Scotland and Wales. As a Shotgun Cabinet manufacturer we produce three different types of shotgun cabinet. Breakdown shotgun cabinet which measures 840mm (H) x 225mm (W) x 220mm (D) and features a single euro style lock. The unit fully complies with British standard 2881:1994 and is designed for the customer with a small number of shotguns who uses them infrequently. Three-gun full length shotgun cabinet which measures 1310mm (H) x 225mm (W) x 220mm (D). This shotgun cabinet features two-euro cylinder locks and can store three shotguns without the need to break the barrel from the forelock. Five-gun full length shotgun cabinet which measures 1310mm (H) x 315mm (W) x 220mm (D). This shotgun cabinet like the three-gun shotgun cabinet above also features two-euro cylinder locks but can store five shotguns without the need to break the barrel from the forelock. When you purchase directly from us, the Shotgun Cabinet manufacturer, you can be assured that not only are you buying a quality British made product but that you are getting good value for money too. In the twenty-five years we have been a Shotgun Cabinet manufacturer we have never had a shotgun cabinet either stock or one of our bespoke shotgun cabinets criticized by a firearms officer. 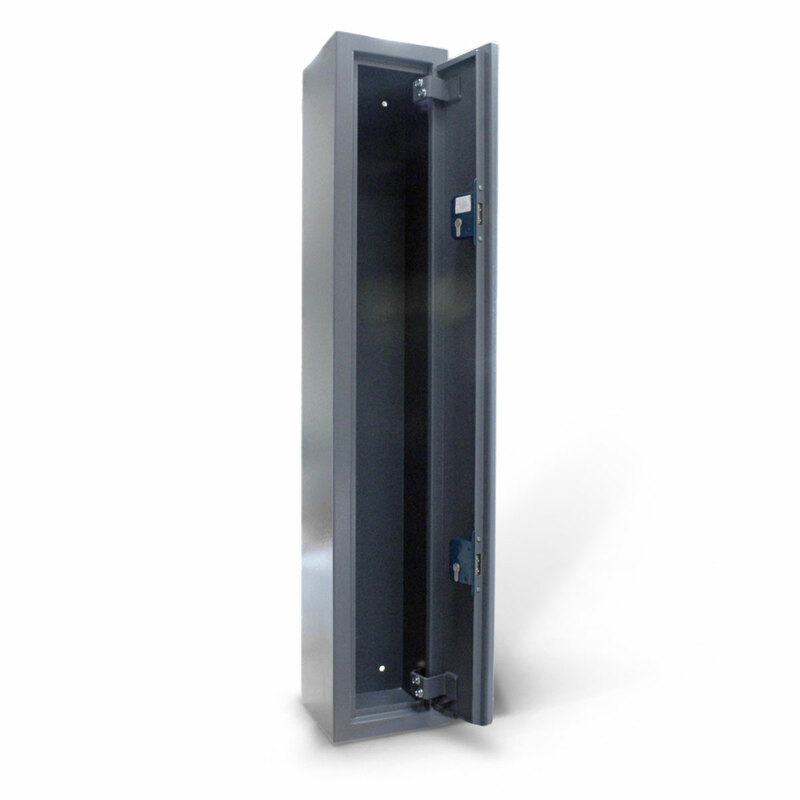 We manufacture to BS 7558 which requires a fully welded cabinet construction throughout and incorporates either one or two x 6 Pin Euro-profile cylinder locks with an anti-pick feature built into the cabinet construction. Three keys are supplied with each lock and concealed adjustable hinges are welded securely to the cabinet body. We use 2mm thick steel throughout construction and the door features an interlocking folded anti-jimmy return to help prevent forced entry. Our shotgun cabinets are finished in a durable grey Hammerite polyester powder coating.